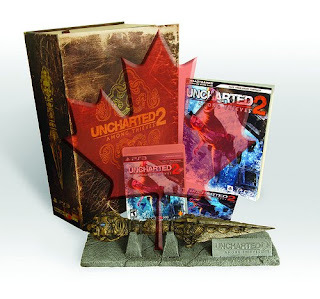 It wasn't too long ago when our gaming counterparts in the US were given the opportunity to win a very limited Uncharted 2: Among Thieves Fortune Hunter Edition. Well PlayStation.ca is now giving us Canadians the opportunity to win as well. Go to PlayStation.ca and you can enter to win one of 5 Uncharted 2: Among Thieves Fortune Hunter Edition games. All you have to do is simply answer 3 Uncharted trivia questions correctly in order to access the contest entry form. The contest runs until November 23 (10:00 ET).